Craig Lowrie, in his official role as a referee, leads the teams out for the Youth Cup Final at the Cameron Gunn Festival. Craig Lowrie is better known in local football circles as a hard-tackling midfielder who has now made a successful conversion to refereeing. But the 37-year-old from Selkirk is refusing to take a break ahead of the new season. Instead, he is taking on three ultra marathons in three days to raise money for a family member. Craig’s wife Andrea’s 13-year-old cousin Taylor Scott was diagnosed with leukaemia around New Year, prompting the whistler to come up with the challenge of running from the source of the Tweed, to its end point at Berwick-Upon-Tweed, a distance of almost 100 miles, in 72 hours. “Taylor was rushed into hospital on Christmas day after saying she felt unwell,” explained Craig. After going over several options, including running three half marathons in a calendar year, Craig decided he needed a bigger challenge and so decided to run the length of the Tweed from Tweedsmuir to Berwick in three days. 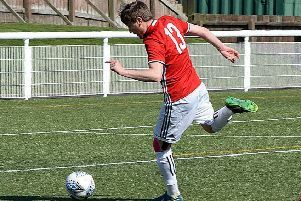 “There is a real mixture of nerves and excitement ahead of the run,” added Craig, who played for numerous East of Scotland and Border Amateur league teams, as well as serving as co-manager at both Leithen Rovers and Gala Rovers. “I have only run 13 miles competitively before, so this is a huge effort for me, but the money raised will help Taylor to go on her dream trip to Japan. “The response to this has been fantastic and I’ve got people wanting to run it with me and others thinking about it. Craig has only two weeks left to train for his challenge, but has already smashed through his original £1,000 target. “I have already had a huge amount of sponsors, all of which I am very thankful for, and I now hope to break the £1,500 mark,” he said. The daunting three-day event starts on Friday, July 3, at Tweedsmuir, with Craig running alongside others through Peeblesshire, reaching Innerleithen on their first night. The next day he sets off for Kelso, via Walkerburn, Galashiels, Melrose and St Boswells, before the final day through Cornhill and Norham to Berwick’s harbour wall. Taylor’s mother Tanya said: “It is a great gesture by Craig and we wish him all the best.